This male Siskin shows the striking black and yellow wing pattern. Note the faint dark streaks on the birds green back and the dark streaks on the birds flank. A fairly common resident breeding bird in middle Europe and UK. Numbers greatly increase in winter due to birds moving from Northern regions of Europe. A bird of spruce and pine tree forests, in winter more widespread and commonly found in alder trees. A regular visitor to garden bird feeders in cold weather. 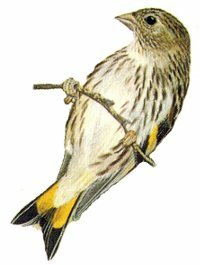 The Siskin is closely associated with conifers however in winter it can be found in small flocks almost anywhere, although it is not usually a ground feeder like most other finches in winter. Siskin can be acrobatic when feeding and often hang upside down on feeders or branches. 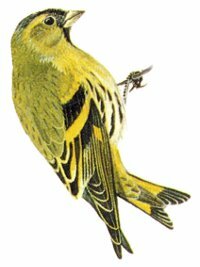 The male Siskin is a mostly a yellow/green bird with black on the head, wings and tail. Distinctive in flight with a yellow rump and wing bars. 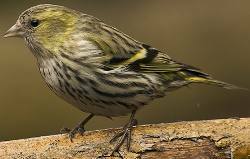 The female Siskin lacks the black head markings of the male and has a generally much duller appearance. The females breast is heavily streaked and shows no yellow. This female shows the extent of the black streaking, not present on the male bird, also note the lack of black on the head. The female still has bright yellow wing bars and tail markings. Note: The female birds in this video appear to have white wing bars, they would usually be pale yellow, it could be that they are young immature females, it could also be a more Northern race as the birds were filmed in Eastern Europe. Any ideas please contact me.